A lymphocyte is a type of white blood cell (leukocyte) in the vertebrate immune system. The two main types of lymphocytes are T cells and B cells, which function in the adaptive immune system. Other lymphocyte-like cells are commonly known as natural killer cells, or NK cells, and are part of the innate immune system. The NK cells are sometimes labeled "large granular lymphocytes," while the T cells and B cells are labeled as "small lymphocytes." Lymphocytes play an important and integral role in the body's defenses, and are part of a system of extraordinary complexity and coordination. While offering protection against millions of possible invaders, including viruses, bacteria, are cancer cells, lymphocytes allow normal body cells and helpful, symbiotic bacteria to flourish at the same time. All of this reflects a stunning intricacy and harmony. The two main categories of lymphocytes are the B lymphocytes (B cells) and T lymphocytes (T cell), both of which are involved in the adaptive immune system (Alberts 1989). B cells specifically are involved in the humoral immune system and produce antibodies, while T cells are involved in the cell-mediated immune system and destroy virus-infected cells and regulate the activities of other white blood cells (Alberts 1989). In essence, the function of T cells and B cells is to recognize specific “non-self” antigens, during a process known as antigen presentation. Once they have identified an invader, the cells generate specific responses that are tailored to maximally eliminate specific pathogens, or pathogen infected cells. B cells respond to pathogens by producing large quantities of antibodies that then neutralize foreign objects like bacteria and viruses. In response to pathogens, some T cells, called "helper T cells," produce cytokines that direct the immune response while other T cells, called "cytotoxic T cells," produce toxic granules that induce the death of pathogen infected cells. Following activation, B cells and T cells leave a lasting legacy of the antigens they have encountered in the form of memory cells. Throughout the lifetime of an animal, these memory cells will “remember” each specific pathogen encountered, and are able to mount a strong response if the pathogen is detected again. In addition, lymphocyte-like cells called natural killer (NK) cells are involved in the immune system, albeit part of the innate immune system. They play a major role in defending the host from both tumors and virally infected cells. NK cells distinguish infected cells and tumors from normal and uninfected cells by recognizing alterations in levels of a surface molecule called MHC (major histocompatibility complex) class I. NK cells are activated in response to proteins called interferons. Activated NK cells release cytotoxic (cell-killing) granules, which then destroy the altered cells (Janeway et al. 2001). They were named "natural killer" because of the initial notion that they do not require prior activation in order to kill cells which are missing MHC class I. The adaptive immune system, also called the "acquired immune system" and "specific immune system," is a response of the body whereby animals that survive an initial infection by a pathogen are generally immune to further illness caused by that same pathogen. The adaptive immune system is based on dedicated lymphocytes. The basis of specific immunity lies in the capacity of immune cells to distinguish between proteins produced by the body's own cells ("self" antigen—those of the original organism), and proteins produced by invaders or cells under control of a virus ("non-self" antigen—or what is not recognized as the original organism). This distinction is made via T-Cell Receptors (TCR) or B-Cell Receptors (BCR). In many species, the adaptive immune system can be divided into two major sections, the humoral immune system and the cell-mediated immune system. The humoral immune system acts against bacteria and viruses in the body liquids (e.g., blood) by means of proteins called immunoglobulins (also known as antibodies), which are produced by B cells. Secreted antibodies bind to antigens on the surfaces of invading microbes (such as viruses or bacteria), which flags them for destruction. An antigen is any substance that causes the immune system to produce antibodies. 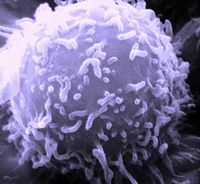 The human body has the ability to form millions of different types of B cells each day, and each type has a unique receptor protein (referred to as the B cell receptor, or BCR) on its membrane that will bind to one particular antigen. 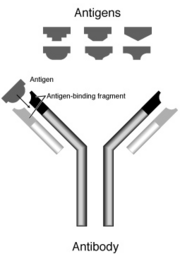 An antibody is a large, Y-shaped protein used to identify and neutralize foreign objects. The cell-mediated immune system, the second main mechanism of the adaptive immune system, destroys virus-infected cells (among other duties) with T cells. Cell-mediated immunity is an immune response that does not involve antibodies, but rather involves the activation of macrophages and natural killer cells, the production of antigen-specific cytotoxic T lymphocytes, and the release of various cytokines in response to an antigen. Cell-mediated immunity is directed primarily at microbes that survive in phagocytes and microbes that infect non-phagocytic cells. It is most effective in removing virus-infected cells, but also participates in defending against fungi, protozoans, cancers, and intracellular bacteria. It also plays a major role in transplant rejection. Mammalian stem cells differentiate into several kinds of blood cells within the bone marrow (Abbas and Lichtman 2003). 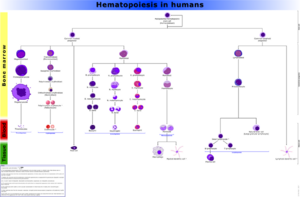 This process is called hematopoiesis. All lymphocytes originate, during this process, from a common lymphoid progenitor before differentiating into their distinct lymphocyte types. The formation of lymphocytes is known as lymphopoiesis. B cells remain in the bone marrow to mature, while T cells migrate to and mature in a distinct organ called the thymus. Following maturation, the lymphocytes enter the circulation and peripheral lymphoid organs (e.g the spleen and lymph nodes) where they survey for invading pathogens and/or tumor cells. The lymphocytes involved in adaptive immunity (that is, B and T cells) differentiate further after exposure to an antigen; they form effector and memory lymphocytes. Effector lymphocytes function to eliminate the antigen, either by releasing antibodies (in the case of B cells), cytotoxic granules (cytotoxic T cells), or by signaling to other cells of the immune system (helper T cells). Memory cells remain in the peripheral tissues and circulation for an extended time ready to respond to the same antigen upon future exposure. 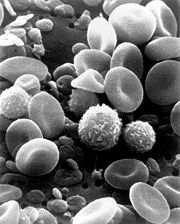 A scanning electron microscope image of normal circulating human blood showing red blood cells; several types of white blood cells including lymphocytes, a monocyte, and a neutrophil; and many small disc-shaped platelets. Microscopically, in a Wright's stained peripheral blood smear, a normal lymphocyte has a large, dark-staining nucleus with little to no basophilic cytoplasm. In normal situations, the coarse, dense nucleus of a lymphocyte is approximately the size of a red blood cell (about 7 micrometres in diameter) (Abbas and Lichtman 2003). Some lymphocytes show a clear perinuclear zone (or halo) around the nucleus or could exhibit a small clear zone to one side of the nucleus. Polyribosomes are a prominent feature in the lymphocytes and can be viewed with an electron microscope (Abbas and Lichtman 2003). The ribosomes are involved in protein synthesis, allowing the generation of large quantities of cytokines and immunoglobulins by these cells. It is impossible to distinguish between T cells and B cells in a peripheral blood smear (Abbas and Lichtman 2003). Normally, flow cytometry testing is used for specific lymphocyte population counts. This can be used to specifically determine the percentage of lymphocytes that contain a particular combination of specific cell surface proteins, such as immunoglobulins or cluster of differentiation (CD) markers or that produce particular proteins (for example, cytokines). In order to study the function of a lymphocyte by virtue of the proteins it generates, other scientific techniques like the ELISPOT or secretion assay techniques can be used (Janeway et al. 2001). A lymphocyte count is usually part of a peripheral complete blood cell count and is expressed as percentage of lymphocytes to total white blood cells counted. An increase in lymphocytes is usually a sign of a viral infection (in some rare cases, leukemias are found through an abnormally raised lymphocyte count in an otherwise normal person). A general increase in the number of lymphocytes is known as lymphocytosis, whereas a decrease is lymphocytopenia. This page was last modified on 2 April 2008, at 11:28.